IMPORTANT: When you register you must enter your payment card VISA or Master Card, with which to check, remove and immediately return the $ 1. 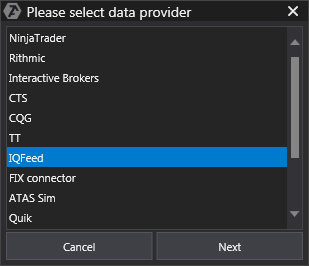 Before you connect through IQFeed ATAS in the platform, make sure that you have downloaded and installed the latest version of the client software IQFeed. You can download it here. After the establishment of the program in the window that opens, enter the account data IQFeed, which are specified in the letter. 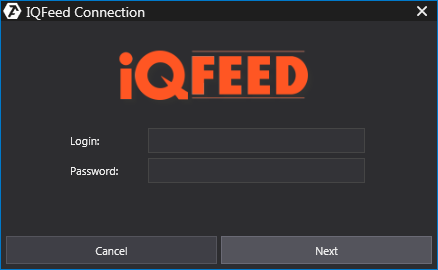 In this window, you select the connection type IQfeed and click Next.